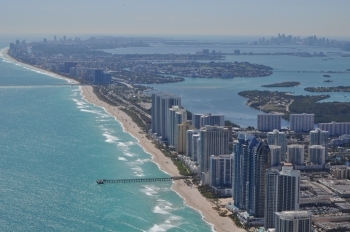 Located at northern portion of Miami-Dade county the cities of Aventura, Sunny Isles Beach and Bal Harbour represent some of the most exciting and exclusive high rise condominiums in the eastern USA. Flying into Fort Lauderdale International airport to the north or Miami International airport to the south it’s obvious that a third skyline in between the two stands out almost large enough to rival either cities of Fort Lauderdale or Miami. If looking for big city and luxury living is high on your list the Aventura–Sunny Isles Beach–Bal Harbour area should be seen. Combined with business and the high end shopping scenes of the Bal Harbour Shops and Aventura Mall this region is a shoppers paradise along with the Turnberry Isle Resort . These cities are known for international home owners as well as local socialites that make Miami exciting.